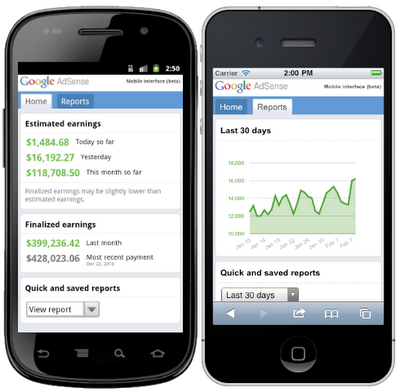 AdSense Mobile Interface – I’m Loving It! I love checking AdSense earnings every day on my mobile. All these days my mobile browser, opera, rendered the heavy desktop version of AdSense interface and it was tough to navigate around and see the earnings. To solve the problems of me as well as millions of other AdSense users, Google yesterday released a mobile version of AdSense user interface that works on almost all the mobile platforms – iOS, Android, Windows Phone 7, Symbian and many others. If you have opted for the new beta user interface of AdSense, you will be presented with the mobile version when you https://www.google.com/adsense on your mobile. Here is a screen grab of how looks like on iPhone and Android device.It looks similar on my Nokia mobile too. The Adsense interface for mobile is very nice – on the home page I can quickly have a look at today’s earnings, recent payment amount, last month finalized amount and the total unpaid balances. The quick reports option available the bottom of the screen lets me access a graphical view of useful earnings reports like – Last 7 days, Last 30 days, This Month and Last Month. You can also create your own reports and save them to this list for quick viewing. To view the graphical reports, you don’t need FLASH on your mobile. For more details check out the official post on Google Adsense blog. 1 Comment on AdSense Mobile Interface – I’m Loving It! Well this is really a great news for all adsense owners. Now they have chances to get more money from it. Thanks for update.